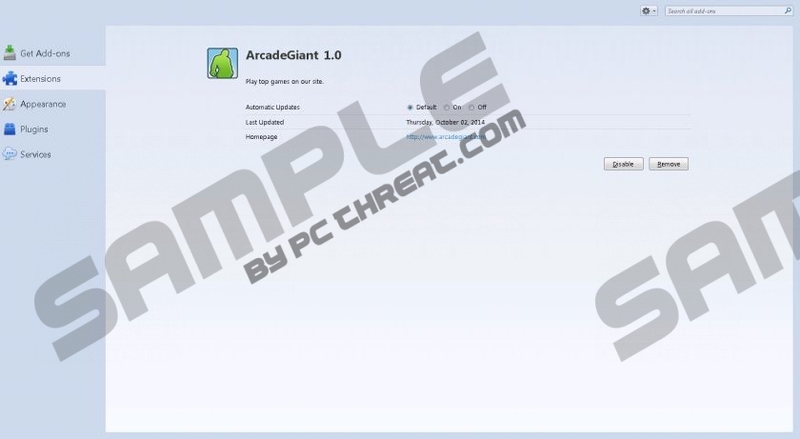 ArcadeGiant is a browser add-on which has to be downloaded so that the user can play premium games at arcategiant.com. The program is free of charge, and, in return for the chance to play free games, the user has to put up with various third-party advertisements, none of which is endorsed by ArcadeGiant. The ArcadeGiant browser add-on is categorized as adware, and we recommend that you remove it from the computer as soon as you can. By installing the ArcadeGiant program, you agree to be provided with pop-ups, pop-unders, web banners, shopping-related advertisements, and other third-party content. Moreover, some advertisements may be displayed on the screen before or during the game play, which may be quite annoying. We advise you to avoid clicking on ArcadeGiant advertisements because some of them may be associated with insecure websites. The creators of the program accept no responsibility for the content shown on your screen, and, by using the program, you accept responsibility for your interaction with the different advertisements and associated websites. ArcadeGiant endorses neither the advertisements nor the products or services advertised; hence, we recommend that you remove the browser add-on from the computer so that you can bypass insecure pop-ups and browse the Internet without difficulties. In case you access an unknown website that offers good deal, you should make sure that the website is reliable; otherwise, you may not like the consequences that follow. Similarly to other advertising-supported browser add-ons, ArcadeGiant records some anonymous information related to your browser settings and browsing habits. For example, the program records your Internet service provider, operating system, browsers, websites viewed, and some other details. Another interesting fact about ArcadeGiant is that this program is identical to ArcadeSafari, ArcadeYum, GreatArcadeHits, and some other programs. All these identical programs signify that the developers seek to attract as many computer users as possible and help third parties drive more traffic. If you do want to be secure on the Internet and avoid insecure websites, you should remove ArcadeGiant, or any other advertising-supported program, and shield the system against malware and spyware threats. It is possible to uninstall ArcadeGiant, but our advice is to use a reputable anti-malware program so that you can browse the Internet safely. We recommend using SpyHunter because this real-time security program eliminates Trojan horses, browser hijackers, ransomware infections, adware, and many other dangerous programs. Select Uninstall a program and uninstall ArcadeGiant. After uninstalling the unwanted browser add-on, you should scan the computer to make sure that all the files are deleted. You can do so using the scanner available below. Quick & tested solution for ArcadeGiant removal.